Born in Buenos Aires in 1971, he lived and studied in San Isidro, Buenos Aires. He became a primary school teacher in 1993. In 1994 he settled permanently in San Martín de los Andes. He studied photography with Pablo Camperi. Once he decided to specialize in documentalism and photojournalism, he studied in Barcelona with Jordi Marti Costa, and worked in Bosnia, Serbia and Croatia. He perfected illumination and studio photography with Josep Maria Saurí, a photographer in Arenys de Mar, Catalonia. He started working as a teacher in the “Reporter Academy” photojournalism school in Barcelona in 2013, and when it closed he became a partner of the new school, “Pina Photo”, based in Barcelona, with Jordi Marti Costa. As a teacher and partner he keeps on working in Bosnia and Serbia, and in 2015 included the northern areas of Argentinian and Chilean Patagonia. In these years he has exhibited his work about the eruptions of the Puyehue and Calbuco volcanoes in different spaces in Argenina and Chile. He covered the Srebrenica funerals in Bosnia Herzegovina for four years. He has also contributed with different local, regional and national media. In 2012 he created “Enfocarte”, a school of photography in San Martín de los Andes, which guides students through narrative and documentary works. In October 2015, during the time of the greatest strain for the arrival of war refugees in Europe, he worked in the Island of Lesbos, providing documentary evidence of the situation of those who arrived there escaping from Syria, Afghanistan and Iraq. 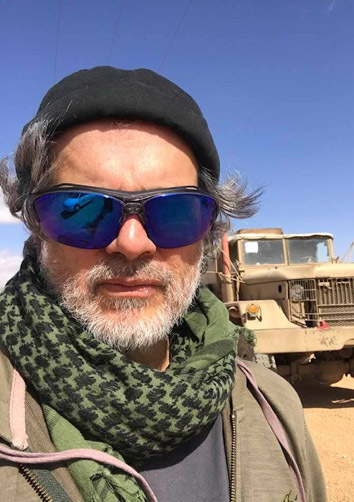 Back in Argentina, together with other people, he founded “Humanitarian Press and Action”, an organization which works in places undergoing humanitarian difficulties. In April 2016 he travelled to Idomeni (border between Greece and Macedonia) where was the biggest refugee camp in Europe, with the aim of telling from there everything that was happening with those over 13,000 people who had been abandoned in that site. In January 2019 Matías Quirno Costa travelled to Syria to carry out a series of graphic reports in a country devastated by war. This work joins the "Refugee" series and provides a frame to the massive migrations which take place in Europe. Currently, Matías Quirno Costa is still working in three projects: “Refugee Camps in the border between Turkey and Syria”, “Refugee Camp of Dabdab in Kenya” and “The woman as a battle field”, about the mass rapes in the Balkans and Rwanda in the 90s. As a freelance photojournalist he also contributes to those media which may so require.